The Babson College Globe has loomed large at the Wellesley business school since 1950, but for decades the 25-ton, 28ft-diameter sphere has been tucked away on a part of campus seldom visited by outsiders. When the idea took hold of creating a park to serve as a centerpiece along the main road of the college, the entrepreneurial school started to think outside the sphere. Their decision would reverberate in a global way. Babson College Globe, before renovation. 2005. In a move of incredible chutzpah, Babson actually moved the world. Not only that, they solved all the planet’s major problems. It wasn’t spinning on its axis properly, so they bought Earth some shiny new orbiting equipment. Next, Babson put the round globe in a square structure to keep it warm over the winter (what could go wrong there?). Finally, you know that old saying, “It’s a small world, but I wouldn’t want to paint it.”? Such a defeatist attitude means nothing to Babson College. That’s right. They painted the world. The globe is about to go from hidden gem to iconic landmark as work nears completion on Kerry Murphy Healey Park, a campus centerpiece slated to debut this spring in celebration of the school’s 100th birthday. The park, funded through millions of dollars in donations, will honor outgoing Babson President Healey, the school’s first female president, and former Massachusetts lieutenant governor. I got a sneak peek inside the iconic campus landmark as work on the globe nears completion. This was the most fun Wellesley sneak peek story I’ve ever done (there Mr. Swellesley, we’re now even on that Sprague Memorial Clock Tower visit you had). Come fly around the world with me. We’re going in to see how the work crew is doing on the year-long refurbishment of the Babson College Globe. This site visit so exceeded my expectations. I totally believe in dangerous climbs and was 100% game to go straight up, no net, no ropes. It was just me versus the close equivalent of El Capitan. I am so Free Solo. Nice photobomb, dude. Left to right: Artists Josh Falk and Dana Woulfe from Boston-based Studio Fresh did the painting. David Grissino, Wellesley resident and Babson’s Director of Capital Projects and Planning, was my tour guide. Grissino has been very busy, indeed. Healey park is just the latest major campus transformation in the past five years. Others include the in-progress sports/recreation complex renovation, the library, and a new innovation hub. In the 1980s, the Babson College Globe barely avoided the wrecking ball after falling into disrepair. At one point covered in enamel tiles, the globe underwent a facelift in the early 1990s and Babson rededicated it in 1993 with fresh vinyl tiles and new satellite imagery. 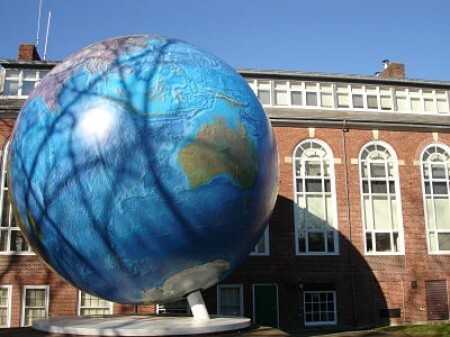 The Babson Globe itself has been around since 1955 and the 28-feet-in-diameter sphere is one of the largest of its kind. Studio Fresh has restored the colorful surface of the Globe. Decades of exposure to the elements had left the surface faded, and the paint had peeled away in sections. There’s the United States. Wellesley is in there just a bit east of the Grand Canyon. To get the Globe across campus, in February 2019 it was eased up onto a flatbed truck and gently transported to its new permanent home at the work-in-progress Healey Park, slated for opening this spring. This is just one gear that will help make the Globe spin, something it hasn’t done since the early 1990s. In true Babson style, the college will have the power to make the world spin fast or slow. Should we be nervous? In all, the mechanics in the base weigh 22 tons. The globe, artists, and workers have been sheltered all winter. When the park is complete, there will be over 100 trees of various sizes and types in a natural-type landscape. The goal is for the park to be a gathering place for students and campus visitors. The park will It will also boast a statue of school founder Roger Babson as well as a reworked edition of the Fountain of Flags, previously in place in front of the Horn Library. Space has been made so that all 100 flags will fly, representing the home countries of the extensive international student body. The Fountain of Flags had room for less than half that number, leaving someone with the unofficial job of “flag swapper” every now and then. Former base for the Babson Globe, Coleman Hall. While the Babson community might be all donated out for now, others are welcome to park their donations at The Swellesley Report to support our independent journalism venture. The World of Wellesley in partnership with the Wellesley Free Library will present a community viewing of PBS documentary Race: The Power of an Illusion. Everyone is invited to view and discuss the series that investigates race in society, science, and history. In a world threatened by overpopulation and over-exploited land, is there a way out of the coming food crisis? For the makers of Seed: The Untold Story, the answer lies in the creation and maintenance of localized seed banks where the collection of traditional, often ancient seed species will ensure both planetary biodiversity and self-sustaining food supplies. This inspiring film tells the stories of courageous individuals and communities across the planet: tribal peoples, citizen-activists, farmers, and others all working to ensure the earth’s sustenance and survival. SEED: The Untold Story reminds us of the inherent and unstoppable power of community activism in pursuit of the preservation of our land, our communities, and our lives. Babson College’s commencement speakers this spring will be Steve Case, AOL co-founder and chairman of investment firm Revolution, and Akio Toyoda (Babson MBA’82), president of Toyota Motor Corp.
Case will address undergrads on the Wellesley campus on Saturday, May 18, and pick up an honorary Doctor of Laws degree. The internet pioneer is also chair of the Case Foundation, which focuses on entrepreneurship for social change. Toyoda will do the honors later that day for grad students and receive an honorary Doctor of Laws degree, too. The commencement ceremony will mark Babson’s 100th in business. Babson College has decided to call what it has been referring to as Centennial Park, a campus centerpiece slated to debut this spring in celebration of the school’s 100th birthday, as Kerry Murphy Healey Park instead. The Wellesley park will be home to both the Babson Globe, which was recently moved there, and the Fountain of Flags that’s now in front of the school library. Not naming it Centennial Park is a good call: As we pointed out when we first heard about plans for Centennial Park, that name could be confused with Wellesley’s Centennial Reservation (a.k.a., Centennial Park). Why inadvertently send a bunch of aspiring business people off into the woods when they’re simply looking to hang out on campus? We had faith that entrepreneurial-oriented Babson could be more creative than that. And why not give students a lesson in the fine art of naming rights to boot? The park, funded through millions of dollars in donations, will honor outgoing Babson President Healey. The state’s former lieutenant governor became the school’s first female president six years ago.